Linen weave cardboard frame with built-in A-frame easel. Available for horizontal or vertical photos. Optional custom imprinting available. Linen weave 4x6 cardboard frame with built-in A-frame easel. Optional custom imprinting available. Linen weave 5x7 cardboard frame with built-in A-frame easel. Optional custom imprinting available. Linen weave 6x4 cardboard frame with built-in A-frame easel. Optional custom imprinting available. Linen weave 7x5 cardboard frame with built-in A-frame easel. Optional custom imprinting available. Frame all your photos and prints just like a professional studio photographer. 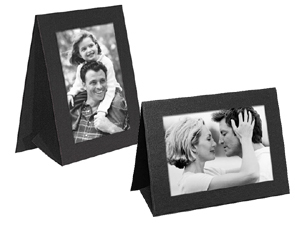 These heavyweight paper photo frames are suitable for a variety of photographs including: Senior and school portraits, family portraits, engagement and wedding portraits, cruise and resort photography.